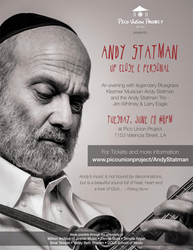 Andy Statman, one of his generation's premier mandolinists and clarinetists, thinks of his compositions and performances as "spontaneous American-roots music and personal, prayerful hasidic music, by way of avant-garde jazz. Klezmer giant Andy Statman has played with David Grisman, Jerry Garcia, and Bob Dylan. Andy Statman is universally acknowledged as one of the world’s premier mandolin and clarinet players. He has appeared on more than 100 recordings, including 20 under his own name. Among those he has recorded and/or toured with are the Grateful Dead, Bob Dylan, Ricky Skaggs, Béla Fleck, David Grisman, Itzhak Perlman, Vassar Clements, and Stéphane Grappelli. A Grammy nominee, Statman has been the subject of numerous feature articles, from The New York Times to Billboard to Rolling Stone. Andy recently received the National Heritage Fellowship, the nation’s highest honor in the traditional arts. Use ticket code 2for1 and bring a friend!